A recent article in Science Daily describes the research conducted by “a team from SISSA’s Language, Cognition and Development Lab” and “colleagues from the Medical University of Tehran and the Institute for Research in Fundamental Sciences of Tehran”. The article in Science Daily is, however, little more than an edited version of the materials on the Lab’s website. The article alleges to bring us to “the origin of language structure” and a new understanding of how human mind and/or brain works, but it is so riddled with problematic statements, factual errors, and internal contradictions that it cannot be taken seriously. Here, I will review just a few of these bloopers. Of the six logically-possible orders of subject (S), object (O), and verb (V)—SOV, SVO, VSO, VOS, OSV, and OVS—human languages exhibit all six, but the possible orders are not distributed equally. As the Science Daily article points out, the majority of the world’s languages exhibit either SOV or SVO order. The exact percentage, however, (listed as 86% by the Science Daily article) depends on the sampling procedure, as well as on the classification of some problematic languages, such as those that exhibit considerably more freedom of word order, as discussed in my earlier post. Languages with verb-initial orders (VSO and VOS) are considerably more rare, while object-initial languages (OSV and OVS) are rarer still. There are only less than two dozen object-initial languages described in the literature; some of them might be more accurately analyzed as having a different underlying word order altogether, as proposed by Mark Baker in Atoms of Language and elsewhere. Let’s now consider the Science Daily article. The first sentence reads: “There are languages that place the verb between the subject and the object (SVO order — Subject/ Verb/ Object) while others place it at the end of the trio (SOV order).” — so far so good, although it might be worth mentioning that the verb may come at the beginning as well, as it does for example in Irish, Arabic, or Malagasy. The second sentence, however, is more problematic; it reads: “The order of these elements, far from being purely decorative, influences efficiency of expression.” Really? Does that mean that Persians express themselves more efficiently than the Italians? Or vice versa? Or are both groups more efficient communicators than the Filipinos (most of them speaking verb-initial languages)? Not to mention the tribes in the Amazonian rainforest, some of which speak object-initial languages—are they to be considered a particularly “primitive” communicators? Let’s consider each boldfaced portion in turn. On the nature of SOV, alleged to be considered “basic” “by scientists”, I am left wondering which scientists the author had in mind. A research article by Merritt Ruhlen and Murray Gell-Mann published a few years ago claimed that SOV is historically the basic word order as, they argued, Proto-Human, the language from which all modern human languages descend, had the SOV order. The work of the SISSA Lab appears to be founded on Ruhlen and Gell-Mann’s work, though they don’t mention so explicitly in their materials that I have read. However, Ruhlen and Gell-Mann’s arguments are rather problematic, as I have discussed here, here, and here. But even if the SISSA Lab’s team follow in Ruhlen and Gell-Mann’s footsteps, it is hardly appropriate to ascribe the claim that SOV is a basic order to “scientists” in general. Surely, “some scientists” or “scientists on the team” or “scientists who conducted this research” would be more appropriate. My second objection comes from consideration of only the SOV-to-SVO change “while the language is evolving”. This focus on only one type of historical change in word order is justified only if we assume that Ruhlen and Gell-Mann are correct, which we have good reasons to suspect that they are not, as I have pointed out in earlier posts linked to above. Contrary to the statement in the Science Daily article that “over the course of history many languages have passed from SOV to SVO, but never the other way around” (which is presented as “fact”, not hypothesis or opinion! ), there are examples of languages that developed in exactly the opposite direction, including (as pointed out to me by George Walkden) Munda, Kamti Tai, Ethiopian Semitic, Akkadian, Yaqui, and Mande. Such changes from SVO to SOV are no doubt as interesting and crucial to the understanding of human language/mind as the reverse. Contrary to this claim, it is neither “necessary” to use case marking (i.e. “small particles attached to nouns to clarify their function within the sentence”) in SOV languages, nor is it true that SVO languages do not use case marking. 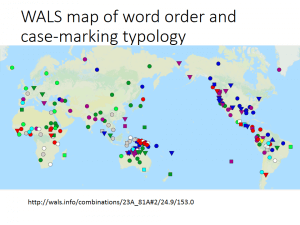 Consider the figures found in the WALS database: there is a slight tendency for SVO languages to use either head marking (i.e. agreement) or no marking rather than case marking (found in languages classified in WALS as “double marking” or “dependent marking” languages), while SOV languages exhibit a slight preference for case marking over head marking or no marking options. As can be seen from the numbers cited below, 46 languages in the WALS sample are SOV yet do not use case marking (alleged to be “necessary” in the paragraph cited above), including Abkhaz in the Caucasus, Ket in Western Siberia and the unrelated Nivkh in Eastern Siberia, and Lakhota in North America. 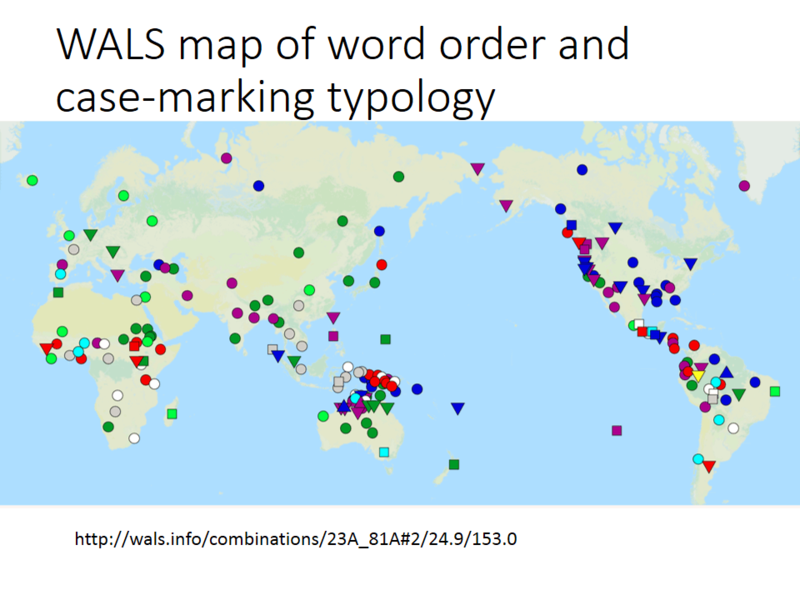 Similarly, 18 languages in the WALS sample are SVO and yet use case marking, including Icelandic, Finnish, and Russian, to name a few. Going back to the last highlighted portion in the quote above about the “computational load” and “more complex grammatical structures”, this clause appears to be self-contradictory, thus being a bad phrasing at best and a flaw in the argument of the underlying research at worst. How can a lightening of the computational load be compatible with “more complex grammatical structures”? At the end of the article, this seemingly contradictory statement is explained by a more detailed description of the experimental research. Apparently, the SISSA team and their Iranian colleagues conducted a “language learning experiment” in which speakers of Italian (an SVO language) and Persian (an SOV language) had to “invent” a sign language. When inventing a sign language from scratch, they appear to come up with an SOV language, regardless of their native tongue’s word order preference, but while inventing a language whose lexical items (signs) were taught to them first, the experimental subjects produced an SVO language, again regardless of what their spoken language was. This is an interesting result in and of itself, but I wonder to what extent the results were biased by the fact that the experimental subjects were inventing a sign rather than a spoken language. Could it be that coming up with the signs for verbs is somehow more complicated than inventing nominal signs? At any rate, the reappearance of the SVO order when lexical signs were taught to the subjects before the experimental portion of the study began throws a wrench into the works of the scientists theory that SOV is the basic word order.